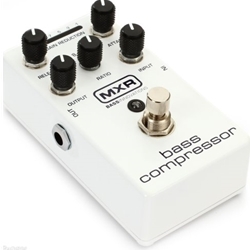 MXR M87 Bass Compressor, a must have for any active bass player..
MXR's M87 Bass Compressor puts studio-grade bass compression right on your pedalboard! You'll love how the M87 puts you in complete command of compression functions, thanks to attack, release, ratio, input, and output controls. The built-in Constant Headroom Technology (CHT) ensures plenty of headroom. You want your bass to retain its character, even during the most energized moments. The M87's transparency never lets the compression compromise your sound. Ten easy-to-see gain-status LEDs let you know when the compression threshold has been reached. Take studio-quality bass tones to the stage, with the M87 Bass Compressor!